When I did my 2016 Fall Home Tour I had quite a few new visitors and a ton of questions about the breadboards I decorate with in my kitchen. 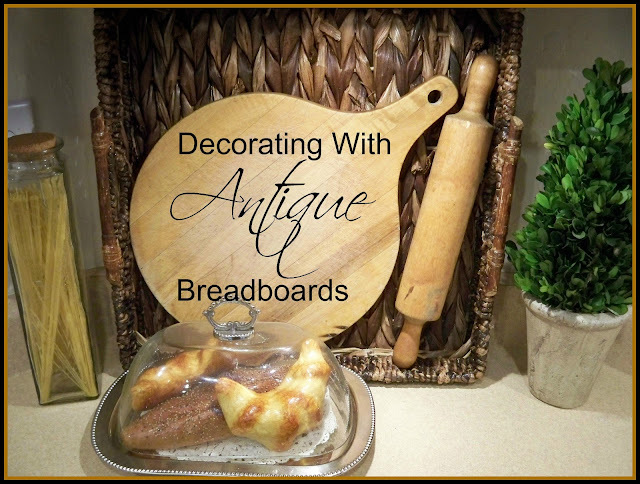 A few years ago I did a post about French Antique Breadboards and it went viral. Seems like a lot of us like breadboards and collect them in all kinds of style, sizes and shapes. I see them being used all over the house in decor. 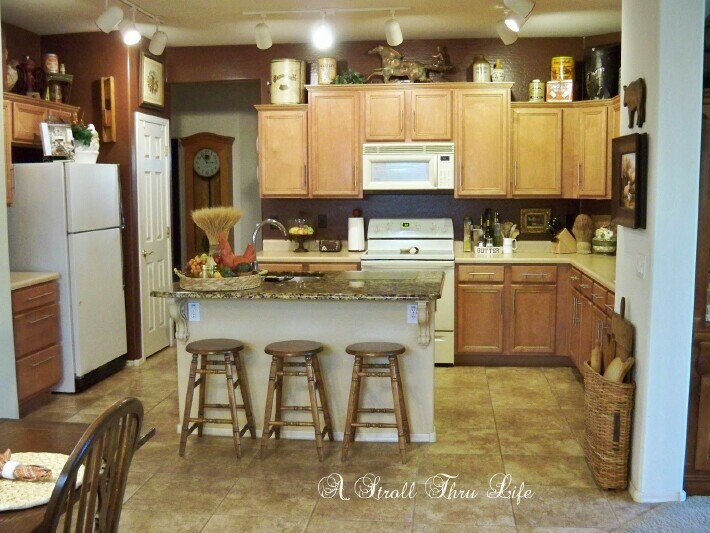 My kitchen mini makeover that I did this summer went from dark and cluttered to light and simple. Breadboards were the perfect choice for my decor. If you have visited here for a while, then you know that this is really pared down and sparse for me. I kept the counter decor pretty light too. On the left side of the stove I keep my napkins and the paper towel holder, so I also like to have a little vignette to go with them. I adore this pig breadboard and I use it all the time, so being able to easily reach it is perfect. It is so fun with my pig napkin holder too. This corner is one of my favorite places of all to play. This was a breadboard that I found years ago and you can tell it has really been used a lot. 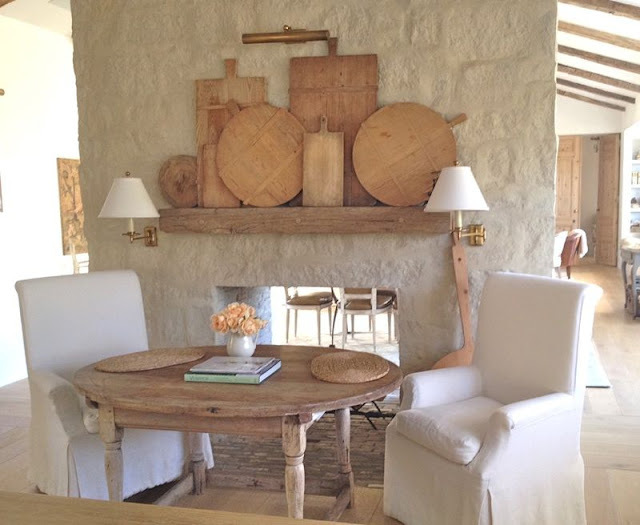 Paired with an old wooden rolling pin it makes a nice statement. The space above the fridge is quite tall since we have 9' ceilings and the cabinets here are standard size. I needed a large space to display my French Antique Breadboard and my WW11 Ammo Basket. I paired them with my Cow silhouette and my Amish Wood Rooster. The small heart handle breadboard was a gift from a very dear friend over 30 years ago. It is one of my most treasured items. Kind of an eclectic combination but I think it works. That Ammo basket use to sit on the floor, but I like it so much better above the cabinets. I love to see how others display theirs, but I think I will keep mine simple for now. So, do you hang yours on the wall, or do you use them in vignettes and do you really use them like I do? Your collection above the cabinets is perfect. I love the look of breadboards in a kitchen. I hang mine on the wall, but love to use them for cheese spreads too. Hi Marty ... Thanks for this timely post. I have lots of breadboards and really no wall space to display them, so they just get stacked someplace. My favorite of yours is the display above the cabinets with the ammo basket. I love your brighter kitchen. I got a few good ideas from you, especially your post on French Antique Breadboards. I see some in one of the blog pictures that I would like to make. I just made a big one for my Harvest table, and want to make a big round one. Thanks and Hally Fall. I love your display! I currently have them in a metal holder made for them, but I sometimes take them out and put in a basket, etc. I'm always on the hunt for these beauties! 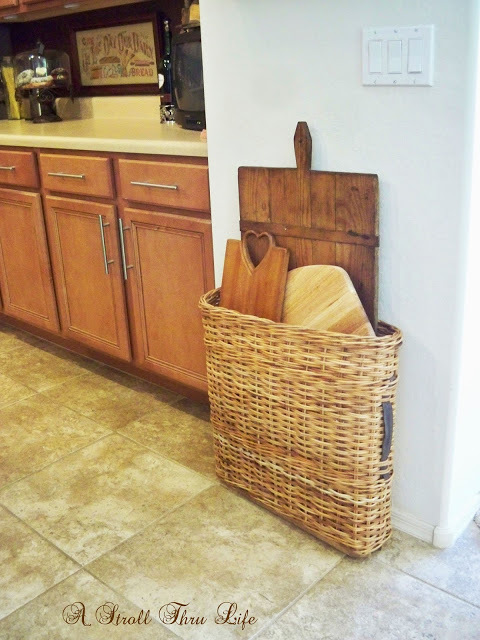 Love the way you have displayed your cutting boards! Love your breadboards Marty..the one with the heart handle is unique and what a treasure....great breadboard inspiration!! I don't have any antique ones, but do have a few new ones. yours look good and there's not too many of them. I don't have any breadboards but I keep seeing them and have wanted to buy one. Your paring down looks so good and the lighter look made a huge difference. I didn't realize that was an ammo basket when you first showed that in the post from a few years ago. Your kitchen looks great, Marty. Thanks so much for sharing my breadboards gallery wall. I do have a thing for vintage breadboards. I have never thought of collecting bread boards. I have one .... I used it every day so it sits on my island. I might have to start looking for them at antique stores. 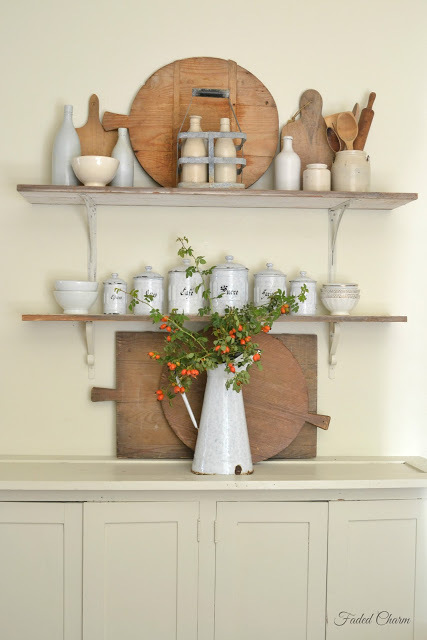 I love the way you've used your bread boards in your pared down kitchen . . . they're all lovely! Thank you for all the great ideas for displaying bread boards, Marty. Your kitchen looks so pretty, and you have some wonderful bread boards. I am really liking how you styled your upper cabinets and it couldn't have come at a better time. I keep seeing mine and wanting a change. So it's on my to do list. Have a great day Marty! Hi Marty! Love the light and bright change. You did a great job styling... sometimes less is more.